Though she is seen here after winning team novice on the flat at 2017 IHSA Nationals, Lilly Hilgers of Savannah College of Art & Design was a blue ribbon winner again in novice flat on December 2nd as the Bees prevailed at the 27th annual Holiday Tournament of Champions invitational in Findlay, Ohio. Findlay, OH - Helped by firsts from freshman Adam Edgar (in intermediate flat) and junior Lilly Hilgers (in novice flat) Savannah College of Art & Design prevailed at yet another Tournament of Champions event. Unlike at the pre-season Tournament when the Bees coasted to a 12 point win this one was semi-close, with Goucher College finishing only five points behind. The 39-34 final in favor of SCAD meant that no team has defeated the Bees in an IHSA show or a Tournament event since October of 2016. SCAD also has won every TOC event since September of 2016. Other highlights for SCAD included second place ribbons for Sarah Gordon in open flat and Vincent Delissio in walk-trot. Edgar also won the High Medal Division while Olivia Murray was second in the Low Medal Division. 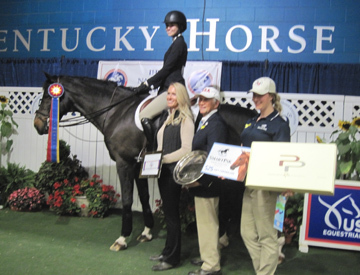 The Medal Divisions are held instead of a ride-off for high point at Tournament of Champions events. Franny Eremeeva of Mount Holyoke College was second to Edgar in the High Medal. Mount Holyoke had two teams in the competition, with team CAUSE scoring 28 points for third place. Millie Brooks of Delaware Valley University received the blue ribbon in the Low Medal Division. The Tournament of Champions series resumes on Saturday, January 20th with the first of two Winter Tournament of Champions competitions held on consecutive weekends. While the Holiday Tournament was held in western Ohio (hosted by the University of Findlay) the next show will be on the eastern side of the state. Ohio University, coached by Tournament series founder Jim Arrigon and his wife Gwen, will host the show at Stonegate Farm in Coolville, Ohio (not far from the West Virginia border). A week later SCAD will have home field advantage, as the fourth of four 2017-18 tourney events will be held at their Ronald C. Waranch Equestrian Center in Hardeeville, South Carolina on January 27th. SCAD, the winner of the 2016-17 Tournament of Champions series trophy, seems a better-than-average bet to retain the award for yet another season.